Including this week, there are four ☀Sunlit Sunday gatherings left. If you haven't done so already, you might want to start following the blogs that you've discovered and are enjoying. My sincere thanks to those people who follow mine. For the readers who responded so positively to seeing some paintings from the AGO last week, a few more may be found in my post from yesterday. One work in particular will be appreciated by knitters and spinners. Moving along, Claire looked quite charming in the sunshine this week. My foster girl has taken to entertaining herself, when not snoozing or looking for attention from yours truly. There was a round of very energetic toy mouse hunting this morning; yesterday found a small mat being attacked and moved from the hall to my living room. Not by me. I take all of this activity as a positive sign that Claire feels safe and comfortable here. On a quieter front, and in anticipation of St. Patrick's day, my shamrock is blooming. The Christmas cactus has less remarkable timing and only a few buds, but I'm pleased to see them. Am I becoming a tad obsessed with photos of Claire? That faraway look in her green eyes, the delicate positioning of her front feet and the swoop of the tail seem to say, "I'm ready for my photo session." Who will adopt her and when? It's time to link your "sunlit" posts. New participants are always welcome; just follow the instructions below. You're not going to keep her? She's so pretty and sits so nicely- she seems quite content. Her eyes are engaging! Lovely Sunlit photos . Oh Claire such the duchess ! My Cacti are in bloom to and my Geraniums are starting as well . Thanks for sharing and hosting . Have a good day ! Wow! What an elegant pose! Great capture, Karen. I hope someone kind will adopt her. Thank you for organizing Sunlit Sunday. Are you planning to organize another meme? Claire is gorgeous as always...my cactus is shooting out a few blooms right now too, they are a welcome diversion from all the snow still outside our windows! Claire is beautiful! Keep the pics coming! She is a lovely looking cat, a beautiful colour! Claire is so beautiful!!! I love cats. And, I haven't seen a shamrock blossom in years! Claire is a beauty! I'd adopt her but my husband isn't as enthusiastic. Sorry. Claire is definitely waiting her photo shoot, lovely eyes, you are going to miss her when adopted. I missed out last week and just catching up this week so sorry I missed your paintings and will try and get around. My cactus has just 9 little buds starting, so it won't be ready for St. Patrick's day either, sweet. 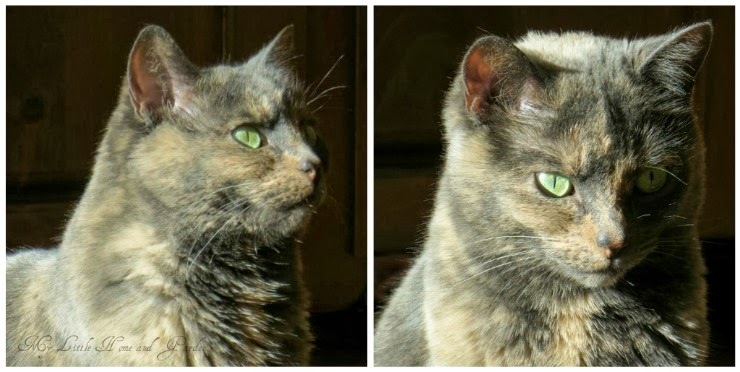 Those sparkling emerald eyes, fine fur and poised posture, make Claire the perfect kitty model. She seems to personify a quiet wisdom and maturity - if she could only narrate her story to us, I'm sure we'd hang on her every word. 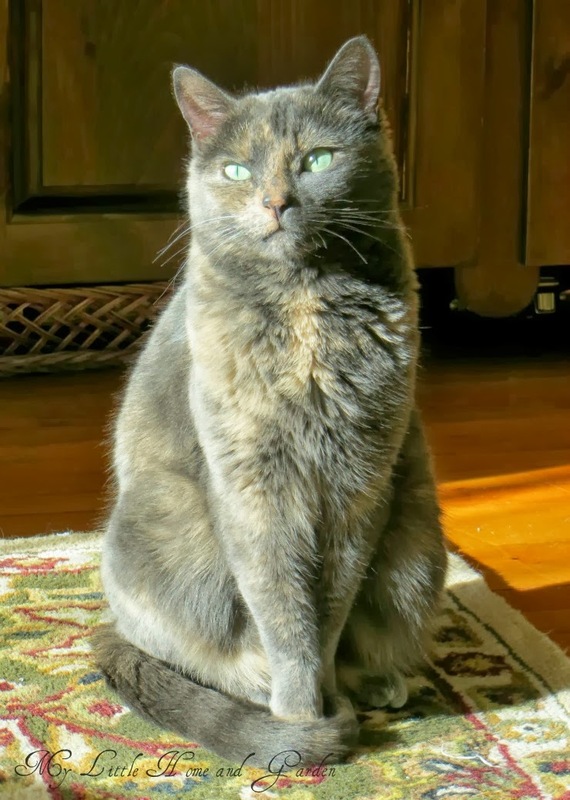 She's a beautiful creature, your feline house guest. Thanks so much for hosting, Karen. Have a lovely week ahead! la semaine prochaine peut'être ?? Love the shamrock! Yes, Claire is definitely ready for her photo shoot. So pretty. I hope a loving family will adopt her. Are you sure you don't want to? Sorry I have not participated much in Sunlit Sunday this year. Life just got in the way. Ohhhhhh, I don't want Claire to be adopted! I want you to keep her! I want to keep seeing pictures of her, and know positively, that she is happy and safe and well cared for and loved. By YOU! I do. I do. I do. Oh please, say you are considering keeping her. Just look at her! What beautiful eyes! What ballerina-like positioning of her paws and tail! How happy and secure, she looks! How can you pass her on.....? To some really unknown fate? How...? Oh, I wish I could adopt her...she is beautiful! Thank you once again for hosting this amazing blog each week, so fun to meet new people! Love that blooming Shamrock! Sweet! We've had to find sunshine creatively these days. Hope someone comes forward to adopt Claire. Have a great week. Cats always find the best spots don't they? Will it be hard for you to give up Claire when the time comes? You seem to be enjoying her company very much. She looks like a friendly cat. I just noticed today that my shamrock, which I thought was dead, is blooming. Not only that it has some romaine lettuce coming up in the pot. Some rogue seeds must have gotten in it. Your link is fun. Thank you. Claire would be so happy to live with you as her forever mom Karen. (hint hint) I actually have a post for next week, so much catching up after being away and a dental issue for me. It's always refreshing to check and see what sunny photos I've got to share, and nice to visit the other posts. What a variety of portrayals of 'sunlit'. Thank you dear Karen for inviting us to your party again!!! Claire is lapping up those rays of sunshine - she's so sweet. I loved the art so I'll nip back tomorrow to see the others. Beautiful pictures... Love your shamrock. Although I don't have a lot of sunlight in my pictures this week,I thought this was a good venue to show the wonderful ice palace. I don't think you could have too many photos of Claire she is such an unusual colour unless it's the way the light has caught her. Lovely sunny pictures.....such an elegant kitty, her front paws are so dainty. It is lovely to hear that she has settled happily with you and started to play. Claire's eyes are wonderful - she looks so regal. Love your pictures.. So beautiful.. As I worked too many hours last week, I had to do some digging to come up with pictures and a post for this week.. but I made it... Have a wonderful St Patrick's Day Karen.